The 2010 LA Auto Show punched way above its weight. Check it out. The Urban Luxury Concept could only have been made by Cadillac; it's small but it's still as brash as a Caddy should be. The luxury part comes from leather seats and posh trim, and the urban bit is covered by a pair of scissor doors. Before you move on, the new Camaro Convertible is relevant to us here in the UK because GM is soon to begin officially importing it. No diesel, obviously, but by heck is it cheap. Rumour has it Ford will soon stop showing different versions of the Focus at motor shows and actually release the thing. For LA it wheeled along a racing version, set to debut at the 2011 BTCC. Some tuner companies brought theirs along too, putting Halfords product managers on red alert. The Honda Fit EV is the electric Jazz by a less musical name. It hits US showrooms in 2012, has a 100-mile range and performs similarly to a 2.0-litre petrol version, says Honda. Sounds good to us. Jag gives its 'jet car' an American debut in LA, showing the Yanks exactly what a 205mph quad-engined electric supercar with twin-turbine generators looks like. It's one cool cat, as The Fonz might say. Kia's maiden soiree into the world of production hybrids comes with the Optima. It has a 2.4-litre four-cylinder petrol engine linked to an electric motor, and will drive on electricity only at speeds up to 62mph. What on earth 'Spyder Performante' means we have no idea. Anyway, this high-performance Gallardo convertible, making its world debut in LA, is essentially a Superleggera sans metal roof. Looks the business, as do all new Lambos. Lotus hauled its bevy of brand new exotica to LA, fresh from the dumbfounding Paris launch bonanza. And of course there were more celebs - this time Sharon Stone and William Baldwin. He sat cross-legged on the bonnet of an Esprit in a kilt then...well...we're still trying to forget about what happened next. Only joking. Los Angeles marks the public debut of the dramatic Mazda Shinari concept. The four-door, four-seat coupé introduces a new design philosophy: Kodo or 'soul of motion'. Expect to see echoes of the design in future Mazdas. Mazda shows the US version of the Mazda5 in LA. The 5 offers seating for six and is powered by a 2.5-litre engine with a choice of manual or automatic gearboxes. It is billed as a 2012 model. The paint has hardly dried on the new Mercedes CLS, but already AMG has rocked up with its daddy, making its world debut in LA. It's got a 5.5-litre twin-turbo V8 and compared to its predecessor is a green god. AMG has also announced a marketing tie-up with superbike maker Ducati. The Mercedes-Benz F-Cell makes its North American debut at the LA show. Based on the B-Class, it uses a hydrogen fuel cell to generate electricity. Performance is said to be similar to a 2.0-litre petrol car's with a 240-mile range. A small number of F-Cells will be leased to customers in the USA. The North American version of the Mitsubishi i-MiEV is launched in Los Angeles. The body is enlarged to provide more passenger space. New front and rear bumpers are fitted and it gets airbags that detect passengers' seating position and control the deployment force. The sleek Ellure concept is a plug-in hybrid vehicle being shown for the first time in Los Angeles. It's not the prelude to a new D-segment saloon from Nissan, but rather a study in what a big four-door aimed at 'active women' might look like. The soft-top Nissan Murano Cross Cabriolet is described as the world's first crossover convertible and is aimed at the American market. It features a fabric hood and promises enough room for four people and their luggage even with the roof down. The CrossCabriolet will go on sale in 2011. The Porsche 911 Carrera GTS, like the Speedster, is appearing for the first time in the USA. It fills a gap in the range between the Carrera S and the GT3. With a 3.8-litre, 408bhp engine, choice of manual or PDK gearboxes and availability as either a coupé or cabriolet. Making its American debut in LA the Porsche 911 Speedster harks back to the Fifties. It comes with a 402bhp engine and seven-speed PDK gearbox. Just 356 examples will be built - a number that pays tribute to the original Porsche 356 Speedster. 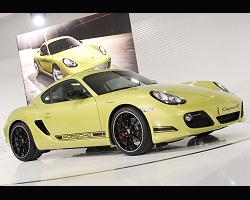 The Cayman R is the fastest, lightest, most powerful and most expensive version of the Porsche two-seat coupé yet. Just taken delivery of a brand new 911 Carrera? Probably best not read this, then. Land Rover's 'baby Range Rover', the Evoque five-door, makes its world debut in LA. It promises to combine environmental sustainability with the premium interior Range Rover customers expect. Saab's new 9-4X crossover made its first public appearance in Los Angeles. It is billed as an 'alternative choice for independently minded customers' and comes with a 2.8-litre turbocharged V6. The latest addition to the Swedish manufacturer's range will go on sale in North America next May. The Impreza Concept marks a volte-face for Subaru as it tries to resuscitate the car's iconic image. The Impreza is back to four doors, people - Subaru has finally admitted that playing Golf with its WRC legend has failed. This stylish LA show debutant is a sign that Subaru is finally finding the plot again. Set to begin real world trials next year, the RAV4 EV has an electric drivetrain built by none other then Tesla Motors, and a body with some futuristic styling tweaks. Series production of the LA debutant begins in 2012. The facelifted Volkswagen Eos makes its debut in Los Angeles. It gets the latest corporate styling cues, shared with the Polo, Passat and Sharan. The tail lights and back bumper are slightly restyled and the keyless entry system can now be used to open or close the roof.